The Belted Kingfisher was formerly named Ceryle alcyon. Along with three other large kingfishers, it was formerly placed in the genus Ceryle with the Pied Kingfisher. 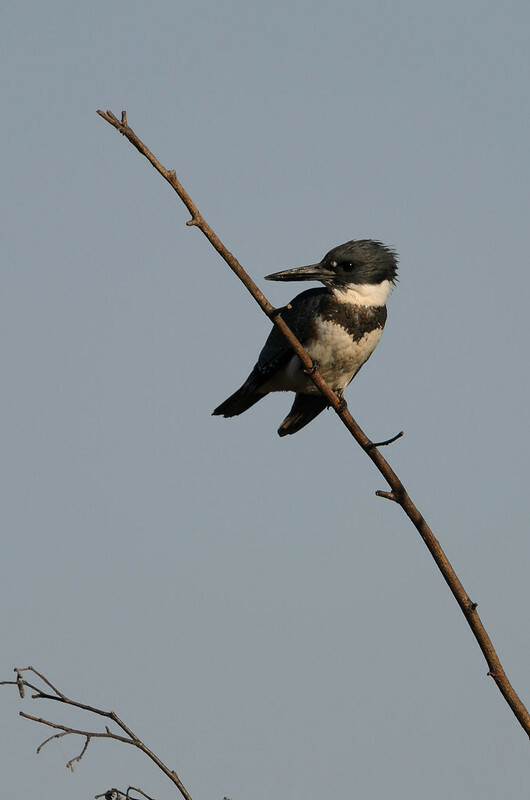 Phylogenetic and mitochondrial DNA analysis shows that Pied Kingfisher is more closely related to the American green kingfishers than to the other four kingfishers. The four kingfishers were subsequently separated as the new genus Megaceryle. I heard this Kingfisher make a loud SPLAT into the lake before I saw him fly up into a tree. I expected him to be carrying his catch, but apparently it got away from him because he was empty-handed. This female Belted Kingfisher was on the alert for fish in the ponds at Hastings Park Sanctuary, Vancouver, BC. While waiting for some action the kingfisher's rival, the Great Blue Heron waded through behind. 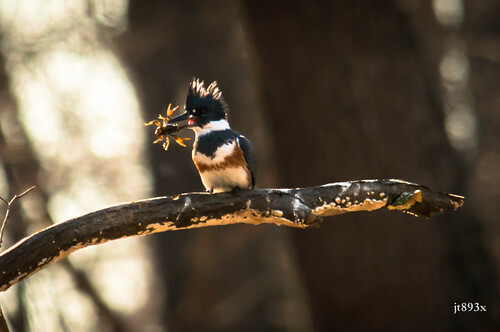 Belted Kingfishers are both elegant and comical. 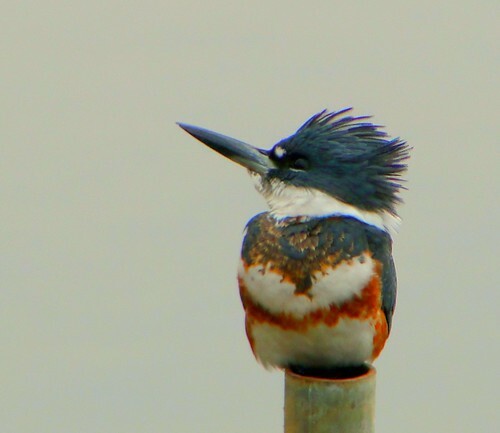 Enjoy watching kingfishers call, fish and express themselves with their crazy Mohawk crest. This female Belted Kingfisher (Ceryle alcyon) was photographed at the Turtle River State Park, North Dakota (28 May 2013). With apologies to Kevin Costner and the creators of the movie, Field of Dreams, I have modified the phrase "Build it and they will come." to "Place it and they will come" and by "it" I'm referring to a convenient perch for a bird. In this case, I had often seen and heard Belted Kingfishers at a nearby marsh. But they were usually perched far out in the water (Where there were perches!). Not great for photos. Plus, Kingfishers are one of the most spooky of all birds...Meaning they fly at the first sight of a human. So I found a spot on the edge of the marsh where I could get a clear view of the water. I found a good looking perch in my woods at home, hauled it to the spot and stuck it in the mud. I set up my pop-up blind about 20 yards away and waited....But I didn't have to wait very long as a Belted Kingfisher found the perch within 15 minutes! The Wingscapes BirdCam http://www.wingscapes.com/ took this video of this female Belted Kingfisher as it fished from the top of a lakeside fish feeder. A new Bird Camera, BirdCam 2.0 with Flash, is available at http://www.wingscapes.com. It takes photos and videos of backyard birds and wildlife while you are away. Please feel free to leave comments and rate our videos.